Every morning at around 5:30, I leave for work. I drive. I start out in Watertown near Target and Home Depot, pass by the Charles River and through Newton, south through west Roxbury and into Jamaica Plain. 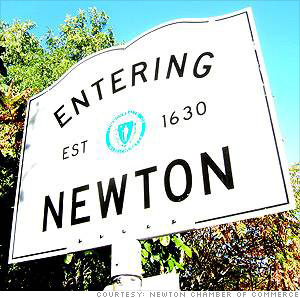 And I used to have this lingering sense of distrust of Newton (it’s a wealthy suburb and I have some judgement issues). But my commute, and the neighborhoods I pass through, has grown on me. I love that Newtonites have put Christmas lights ALL over the trees on the roundabouts, and that someone somewhere decided to leave them on all through the night, even at 5:30 when I pass by. I like seeing the elderly man who is always awake, reading in his living room, and the lady with two giant knee braces who is out walking at 5:30 even though it’s WAY below freezing. It’s striking how seemingly arbitrary things like a commute can have such a big impact on daily life. Having good music. Having a little coffee. Arriving at work before anyone else. It all really helps me to imagine more than my daily tasks. I wish I didn't have to drive, but things being as they are, I'm content with the way my day starts, and ends. And that makes a big difference. How is your commute? Would you switch jobs or move to reduce your commute? If your commute is stressful, how do you deal with the stress and traffic? I liked this article about Christmas trees. In South Africa, people don't use real Christmas trees very much and so my gut reaction was that the plastic ones were better for the environment. This article says this isn't necessarily true. If you celebrate Christmas, how did you decide what kind of Christmas tree to use? We have a real Christmas tree!! Wait a second... Where was I when you got a real Christmas tree?!!! Coming from an old New England family I've always had a real tree; I was brought up to see the artificial ones as a little déclassé. As for sustainability, I figure it's probably a wash, but at least real trees keep farmers in business instead of plastic-factory owners.